You will believe that Patrick and Heath can fly. Thanks for the heads up on "Re-Kill". That and "Wind Walkers" are the only two "8 Films to Die For" that I skipped with this new batch of releases. I thought "Bastards" and "Lumberjack Man" were the best of the lot. Along with Buckaroo Banzai I'm still waiting for the return of Remo Williams. Wow, pretty crazy coincidence that I just happened to watch this for the first time yesterday. Can't wait to hear what you guys have to say about it. Oh my god Heath Holland those impressions are hilarious! Had me in stitches. Great episode, guys! Also, Krypten. You guys are too much. I listened to the podcast while I was driving. The impressions had me in hysterics. I didn't crash the car, but I imagine, I'd still be laughing my head off. 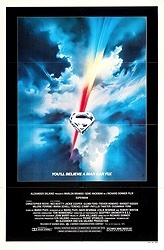 Superman still has 1 of my favorite montages/scenes ever when Jor-El explains to Clark at the Fortress of Solitude about who he is, his powers, & the known universe. John Williams' score & Brando's narration are perfect. With those impressions, instead of "Hollywood", Heath should change his gimmick to Hilarious Heath Holland. At the end of the podcast, Heath says you can't put him in a box or Patrick says he pivots. Since Heath's an old school pro wrestling fan, in honor of the late great Rowdy Roddy Piper, "Just when you think you have the answers, Heath Holland changes the questions!". I love that Piper quote! The killing of the spider moment just might be my favorite thing I've heard on this podcast. But again i have to defend the superman time travel sequence. Superman wasn't exerting a force on the Earth. He was just flying fast enough to go back in time, his love for Lois is so strong that he goes so fast he breaks the flys faster than the speed of light. The Earth changed direction because we were watching time run backward as he traveled. It didn't actually have anything to do with the direction he was flying. I love the way you put this in the podcast "when its good its sooo good". I literally have no problems with the first half of this movie as I actually enjoy a good origin story for my superheroes. How cool would it have been had their just been the major earthquake and you found out at the end of the movie that it was Luthor all along and then he's the star of the 2nd movie with Zod and his gang? While I don't need an origin story its a shame that most movies have to smash the big villain into an origin movie so that neither part can cook to proper movie temperatures. Maybe. I think it's a reflection of where our society is at the moment. We're all paranoid and angry and cynical, and now even our "fun" movies reflect that. It reminds me of the early 1970s, when everyone was fed up with the Vietnam War and disillusioned with the way things where. Seems like we're back there again. Look at The Joker or Bane in Nolan's movies, and you'll find characters that really believe they're doing the world a favor by resetting the status quo. I am on the side of Patrick wkth this film. The optimism and spirit is just charming. I really enjoyed the way Patrick started Heath on a journey of turning to this film's favour. I agree with you both in thinking Christopher Reeve is the best Superman. I am right with you Dennis on my British mind being blown with this American political tome... scary stuff. Come back Christopher Reeve, we need you. Plus, I think I see a cat in a tree. "I love Kryptonite. I mean really, it's unbelievable. Unbelievable. And let me tell you something, we're going to be the best on Kryptonite. We're going to make Kryptonite great again. How are we going to do it? Were going to start winning again. We're going to win and win and you're going to get sick of winning! Superman tells you all these thing, and I mean I'm listening to these things, and I'm like, he lies. Lyin' Superman. You can't trust these Supermen. I mean frankly, he never wins. And we're going to win. I'm the strongest on Kryptonite. And frankly, frankly, the only reason anyone is talking about Kryptonite is because of me. I'm going to make Kryptonite great again." Great pod! Regarding the subject on how threatening Lex is in this film and the seriousness of the situation an audio response will be given on the atlasponypodcast.podbean.com on sunday the 27:th of april. See you there! Random comics recommendation. If you're looking for a great Lex Luthor portrayal (in my opinion at least) you should check out Geoff Johns' current run on Justice League. There's not much Luthor early on, but he really becomes a major focus in the Forever Evil arc, where he's basically forced to become a hero. Since then, he's been trying to reconcile his morals, and he's trying to become a hero mostly because of his desire for love and attention. It's a great run in general, that's been solid since 2011. Great podcast guys! Great podcast. I've been a fan of this movie since I saw it as a kid in the 80s and as a girl I looooved the Can You Read My Mind sequence. Its actually one of my fave parts. But I get why it would be annoying to some. But to a dreamy-eyed 7 year old girl, it was everything!